My family’s been in the fabric business for almost forty years now, beginning when my grandfather finished up his service in the Navy and took a job at a local fabric store in his hometown of Bakersfield, California. My grandfather is one of the hardest working people you’ll ever meet. He took that fabric store job in the early seventies, and, over the course of his career, worked his way to become the Vice President of a large chain of fabric stores here in California. When that company was taken over by a national corporation, he decided to start a store of his own. 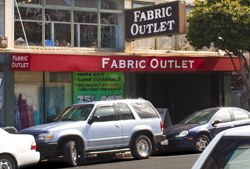 That store became the Fabric Outlet of San Francisco, one of this city’s most treasured fabric and trim shops, offering over ten thousand square feet packed with fabrics and trims from all over the world. Since then, his daughter Gina (my mother) has joined him in the business, and, along with my dad, actively runs the day-to-day operations here at the store. I’ve grown up around fabric, playing hide and seek under the tables at our store when I wasn’t much taller than a yardstick. I’ve helped out at Fabric Outlet since I was old enough to use a price gun (Those who have been a part of a family business will know what I mean). In 2010, after attending college, I decided to join the family business full time, and to try and bring us into the digital age. Over the years, we’ve had lots of people travel to our store from out of town. Many have said that they wished they had a shop like ours near them, or that their local chain store never seemed to have what they needed. This was what prompted us to start Cali Fabrics. We wanted to make our fabrics available to people all over the country, without losing the warmth and feel of a family-owned shop. So, we launched CaliFabrics.com in June of 2011. Our mission from the beginning has been to offer unique and high quality fabrics at the lowest prices possible, and to provide personal, friendly customer service to anyone who calls or emails us. In fact, most of the time you call or email, you’ll be talking to me, or a member of my family. Since our launch, we’ve added thousands of fabrics, and have been able to be a part of many people’s sewing projects, businesses, and hobbies. For us, this has always been, and will always be, about using our passion for fabrics and trims to help you with your passion for sewing, costumes, fashion, crafts, or decorating. We are so grateful, and want to thank each and every person who visits our shop, both online and in San Francisco. None of this would be possible without you.